The Scandinavian jazz quintet Friends & Neighbors will perform at the Popelka Trenchard Glass studio on April 12. Submitted. 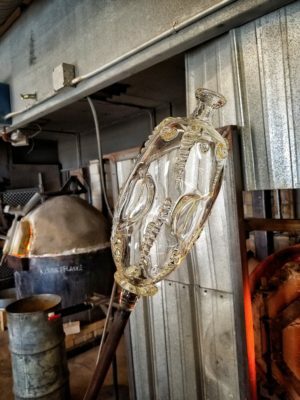 It’s not often that jazz and glass blowing are thought of together, but the freestyle elements that both art forms embrace make a marriage between the two more likely than you’d think. To celebrate their 22nd year in Door County, the folks at Popelka Trenchard Glass are inviting the Scandinavian jazz quintet Friends & Neighbors to play a set after a Norwegian-inspired glass-blowing demonstration on April 12. 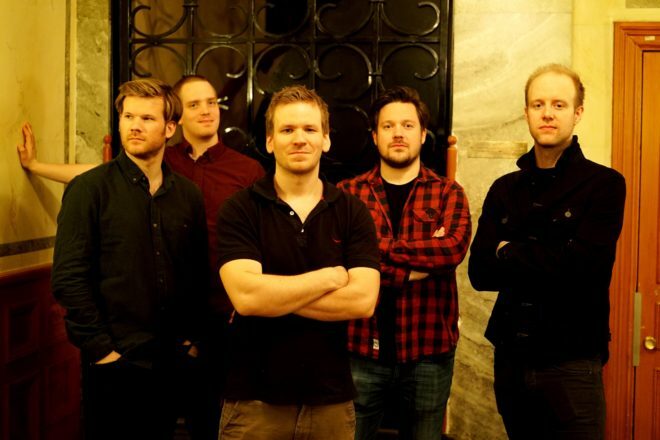 Friends & Neighbors members Thomas Johansson (trumpet), André Roligheten (tenor saxophone/clarinets), Oscar Grönberg (piano), Jon Rune Strøm (double bass) and Tollef Østvang (drums) began their journey in 2009, releasing their first album in 2011. The album, titled No Beat Policy, is a direct reflection of their sound. Playing from the free-jazz perspective, there is no imperative for them to produce a concrete melody or beat. Instead, they improvise on stage, creating a sound in which the members are constantly building on top of one another. Their individuality is apparent, yet their “voices” work in tandem. Jeremy Popelka will demonstrate some Norwegian-inspired glass blowing before the show, including the famous Klunkeflaske bottle. It’s created by slightly inhaling on the blowpipe to collapse the hot glass bottle. Submitted. They list Ornette Coleman — one of the founders of the free-jazz movement in the 1960s — as their first inspiration. Jazz artists at the time wanted to eliminate structures that felt too limiting, so they created something new: the sort of scattered-yet-fluid sound that Friends & Neighbors produces. The group’s live performances on YouTube are a testament to that. (Watch a clip at youtube.com/watch?v=n9L-LSqoYos.) While listening to the players perform a song, you can sense an underlying skeleton or framework that they’re following, but the instruments seem to take their own paths at the same time. The songs begin with everyone in harmony, but soon the players branch off to explore their own melodies. It creates a movement of sound that ebbs and flows, with the instruments separating and coming back together. It makes you wonder what the transition is like to shift from recording in a studio to taking a song to the stage. For the band, there is no difference. It isn’t always easy to understand what a song is about when it doesn’t have the lyrics to tell you, yet Friends & Neighbors’ songwriting is inspired by the same things that you might hear in words: “music, life, politics, love, food, friendship and the belief in a better world,” Johansson said. And it’s these things that have motivated the band for almost 10 years. Johansson said the group’s members have grown immensely as individuals and as a band, with most also playing with other projects, including Johansson’s band Cortex, which has visited Door County before. The band will be performing in the Popelka Trenchard Glass studio on April 12. Jeremy Popelka is excited for music to occupy the space, which isn’t traditionally meant for performance, but where he and his wife perform their own sort of dance with glass. Popelka said the brick that outlines the space provides an interesting acoustic sound, and he’s eager to try something new and to rearrange the studio for the band. Inspired by his Scandinavian guests, he’ll be trying something new with glass, too. The demonstration prior to the band’s set will include creating a Klunkeflaske bottle: Instead of blowing out to expand the glass, the artist inhales on the blowpipe to collapse the glass. There are many things Popelka reflects on fondly after 22 years in Door County, including daily discovery, the ritual of working in the studio and the process and drama of working with dangerous and fragile materials. But collaboration seems to dominate the most memorable moments at the studio, and having Friends & Neighbors take part in the anniversary celebration honors that.